Anthony Bourdain would dish poison if Donald Trump and Kim Jong-un ﻿made reservations for 2. 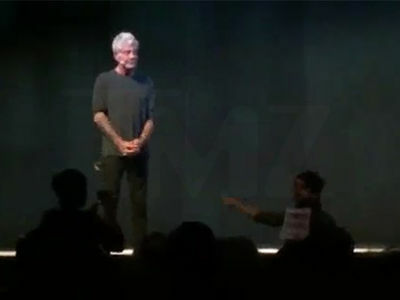 We got Bourdain Thursday at LAX and our intrepid photog wondered -- what would the "Parts Unknown" host serve if asked to cater a peace talk meeting between the U.S. Prez and North Korea's dictator? Check it out ... pretty clear where Bourdain stands with what he'd serve. HINT -- it's vegetarian, but also deadly. Also, doesn't sound like he's got a soft spot for Kim Jong-un, who he calls a "chubby, evil little f***."